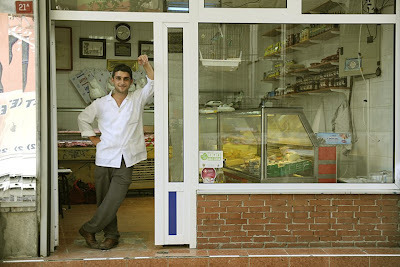 Enver Korkmaz is a butcher in Tepebasi, a few streets of calm amidst Tarlabasi neighbourhood. He’s 28 and for the last eight years he’s run ‘Pinar’. His father set up the shop after migrating to Istanbul over 30 years ago from Erzincan, a town in eastern Turkey. Since the 60s/70s many others from Erzincan have settled here, amongst familiar faces. Men like Ishan, a local plumber, or Ali, an estate agent, both of whom knew Enver’s father (who died four years ago). They watched over Enver and his two brothers as they grew up. Shared roots and big hearts have made for a close-knit community, that feels different from the rest of Tarlabasi. “Trust”, according to Enver is the mainstay of his business. He knows all of his customers and says they have a good relationship built on trust of his produce and his qualities as a neighbour, as one of them. Open from 8am to 9pm, 7 days a week, Enver’s a major part of the street life. A customer can shout down an order from their apartment window, which he’ll prepare and deliver. There are customers who care to stay and chat for a while, over tea and a cigarette. He’ll ask some people to run errands for him, and his neighbours who’ll borrow his stools to sit outside. There are parents who ask Enver to keep an eye on their children playing on the street. Households entrust him with their keys. Some even leave him the key to their strongbox. Enver accepted our invitation to make a project, that would bring together these various groups (and others) for photographs. We reasoned that by recognising these groups, we wanted to show how ‘trust’ in its various guises was important to the community, and reveal the unique social bonds created by Enver. A few days later, we started to take photographs for people that they wanted, of their children and families, and of the local teashop, to help build trust around our intentions. There were some problems. Primarily when a local (mis) informed the police, who then questioned Enver. They warned him not to work with us, saying we worked for an international organization conspiring to damage the community. Enver needed some reassurance, and letter confirming our identity from Platform Garanti did the trick. He showed it the police the second time they visited and said we are doing the photos. People where naturally concerned as to how we as foreigners would try to represent them. Some also spoke of other problems that threaten the community and some of the safeguards taken. For example, local landlords have an informal agreement, that rents here are twice as much as a few streets away in Tarlabasi, to help defend against the encroachment of drugs, prostitution and other ‘undesirables’. Gentrification is also an issue. Relatively cheap buildings, it’s prime location near the city centre, and the attractive renovation opportunities, making Tepebasi a prime site for ‘gentrification’. Whilst some enterprising locals let out rooms, apartments or buildings, which they bought when prices were low, not everyone has the same resources. Enver says he doesn’t want to live or work anywhere else, and with his shop, he can be confident in his chances of staying put. However, some in the community will be priced out, and like the Greeks who once dominated this neighbourhood in the 1950s, will have to find a home elsewhere.